Just as your sign depicts, the Libra 2018 Horoscope is a balance of both good luck and difficult times. You appear to be full of ambition, passion and intensity, giving rise to growth for you. There might be times when you see yourself losing the map and searching for directions in terms of profession and personal life. This period doesn�t appear to be slowing down your progress as your learning and self discovering attitude should point you in the right direction. There may be a change in the way you look and perceive things between February & May 2018. Once this period gets over, you should be set on your way with much more charm and magnetism. Libra 2018 predictions point towards a rather challenging yet dynamic phase in terms of work & career. These should bring out the best in you and open up new opportunities of growth. Don�t let the pressure of handling too many things make you aggressive, the key to success at this point is to maintain your composure and temperament. May & August 2018 is one period where you should be handling situations diplomatically and carefully as a short travel also appears on the cards. A wrong decision or aggressive approach by you might lead to the loss of valuable member of your team. In an attempt to promote your business or work you may end up investing time at the wrong places and with the wrong persons. Avoid yourself from getting distracted and focus more on quality, reliability and better understanding of your work and clients. You may have to set priorities and figure out what�s best for business and growth before making any decision. You might see yourself trying hand at new techniques at work which could be the result of a growth oriented approach. Its smiles all around for Libra in love & marriage forecast for 2018. The year would be positive for relationships with things spicing up during October & November 2018. If you are willing to tie the knot, try to postpone it after December 2018. You are likely to have a very mature approach when it comes to handling matters related to spouse and partner. Looks like the summer months of June & August might see some heated moments at domestic front. Your patience and sensibility should hold the key to subside such controversies or tensions. The financial prospect looks promising in the Libra horoscope with the onset of October 2018. However the period leading up to October also promises to be moderately good with just minor glitches here and there. There is a possibility of a lean year in terms of comfort from children, sibling and matters involving real estate. It would be a good year with few challenges but these should not pose any significant problems in your progress. The time between October & December looks to be the most fruitful and conducive for you. January 2018 Horoscope demonstrates that you may display an intrepid temperament all through the month. Your siblings may become well known in this period. With a non-materialistic inclination, short excursions and journeys are on the cards for you. You may display wit and energy. Your leadership abilities ought to win you gratefulness in this period and your respect and regard at work place may see an ascent. You are additionally prone to grow great administrative qualities, which may ignite ego conflicts with associates. With control and eminence in your ownership, landing a headway in position is quite likely during this period. February Horoscope 2018 shows indications of high energy for you. Your growth in your position of expertise at work is likely. An ascent in social image is not too far off for you. You ought to maintain a strategic distance from any conflicts at work, as it should lessen the stress. You may get regard and respect in this period. Students looking for advanced education may receive open doors from government associations. For working people, peachy monetary profits are shown. Accomplishments in new endeavors are highly likely. Your group of friends may grow in this month. Progeny prospects are not being positively denoted. In this way, care ought to be taken. In general, the month should bring inspiration and success. March 2018 Horoscope depicts a shining term for profession. For working people, financial benefits and development in work is demonstrated. Entering new ventures may bring positive outcomes and grow your network of connections. Your rivals may act against your success out of brewing jealousy. Your wellbeing is likely to endure to some degree. Maintain a strategic distance from any legal actions as it may result in heavy expenditure of finances. Expenses may be directed towards betterment of health. Pointless debates should be ignored and avoided at work. April Horoscope 2018 focuses towards a growth in rivalry for you. With an expansion in your range of abilities, coworkers are probably going to take similar steps. Envy might lead to heated confrontations. Regardless, you ought to restrain from getting associated with any conflicts at work. You should likewise abstain from overexerting your body and take rest when required. Your life partner may encounter a state of mind swings and show indications of self-importance interimly. Your business accomplices may pull in unexpected profits. Travel may be helpful to you on the professional front. Your business may see options for extension. You may likewise observe benefits being acquired from your life partner. 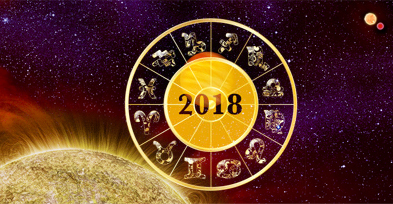 May Horoscope 2018 indicates advancements for your companion. Your soul mate may encounter unexpected development & progress. This may make him/her somewhat pretentious tentatively. Business ventures may be productive. Work accomplices may turn into the wellspring of monetary benefits. A few dissatisfactions on the economic front are additionally denoted. You are advised to do well to deal with your reserve of funds with caution and make monetary commitments after due consideration. Development in territory of work is likely. June 2018 Horoscope denotes an uprising in luck. Fortunes ought to support you for most of the month. Income should remain stable throughout in spite of a few setbacks indicated on the cards. You may have a tendency to pursue religion and may even attempt journeys. There may be a potential inclination towards the spiritual world, which may even prompt otherworldly learnings for you. Your attitude should mostly remain positive and fearless to take on any challenges that life may throw your way. July Horoscope 2018 brings signs of prosperity for the month ahead. General fortune is by all accounts by your side. Success is denoted on all life fronts. Career may see growth and prosperity. Despite some disharmony at home, your social life might see an ascent in popularity and respect. Transitory employment may get permanent. However, obtaining additional resources and educational instruments might cause concerns. Inheritance of hereditary property might be subjected to questionable circumstances. August 2018 Horoscope appears to be the treasury for this year. It brings promise with a number of monetary profits foreseen. Additional efforts to grow in career may be acknowledged and might bear fruitful results. Career may flourish at a stable rate. You may get favors from govt. specialists while credit and acknowledgment for your work may be present. Inexhaustible riches, incredible income, and a raised wage is demonstrated. Nonetheless, local agreements on the domestic front remain a range of concern. September 2018 Horoscope seems to introduce a passive span ahead. The month may require your patience. The monetary profits face the possibilities of loss if not handled carefully. Travel for work for those associated with Govt. is on cards. A few monetary disappointments are on the cards. However, the overall financial stability should prevail. Donations for charity should be promoted. Friendly associations may help boost your confidence. Nonetheless, excessive indulgence might lead to embarrassing moments. October 2018 Horoscope appears to keep you on your toes. Careful management of funds should be applied as indications of monetary dismay are on the horizon. Your health may take a back seat with seasonal ailments looking to keep you down. If proper rest and care is not taken, you might have to spend heavily to recover. Career stability should prevail. Social life may remain humble. November 2018 Horoscope appears to be journal of steady recoveries for you. Gradual improvement in health is denoted. Expenditures made earlier this year might return at a sober pace. With improved energy levels, you are likely to make greater progress on professional as well as financial fronts. You may spend on gathering luxury assets. Financially, stability is denoted. Career may also flourish during this period. December 2018 Horoscope indicates a gutsy closure to the year. With fearless decisions to move ahead, you may observe progress not only for you, but for your kin as well. Success in ventures is almost likely. You may be spiritually inclined & embark on religious journeys. Monetary matters may see prosperity. Career may be stable with respect & acknowledgment on the cards.